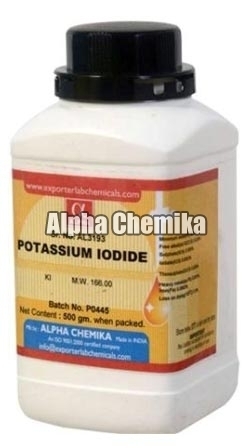 We are a credible Manufacturer, Exporter and Supplier of the best quality Potassium Iodide. Potassium Iodide is odorless, colorless and has a slight bitter taste. Used in pharmaceutical industry, Potassium Iodide comes in a white powder state and is highly soluble in water. Further, our Potassium Iodide is packed with utmost care in air-tight packaging material for prevention from biological contamination.